Crime fiction may be the biggest selling literary genre in the UK but excepting the output of the late ‘Queen of Crime’ Agatha Christie, it hasn’t exactly figured large on the theatrical stage. Britain’s biggest selling crime novelist Ian Rankin and Lyceum artistic director Mark Thomson have set about redressing the balance in their psychological crime thriller Dark Road. 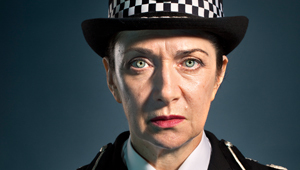 Isobel McArthur (Maureen Beattie) is a thirty year police veteran, Scotland’s first female Chief Constable, mother to a challenging 18 year old daughter and fast approaching retirement with a nagging doubt that just won’t go away. Was the conviction of Alfred Chalmers (Philip Whitchurch), on the basis of a single piece of flimsy forensic evidence, for the murder of four young Edinburgh women, sound? 25 years on Isobel decides to revisit the case to the horror of both her fellow officers and her daughter. The doubts escalate to the point where Isobel questions everything and everyone she knows. If the measure of a play’s success is the quietness of its audience, coupled with unwavering gazes and complete stillness for the duration of a performance, then Dark Road is unquestionably a winner. Save for occasional gasps, some collective jaw-dropping and one lonely cough, the audience sat enthralled for the entirety of its two and a half hour running time. Dark Road retains the complexities and gritty realism of Rankin’s books and like any good crime novel provides enough twists and turns to keep the audience guessing until the very last scene. The only criticism that could be levelled at the piece is that there are a couple of scenes of slightly unnatural and at times, clunky dialogue but these are entirely understandable and necessary due to the theatrical constraints; everything has to be played out and stated on stage for the story to be established. That said, they don’t in anyway detract from the overall quality or pace of the piece. The second act is a masterclass in psychological drama, ramping up both the thrills and tension at a head-spinning pace. The central performances are of such a universally high quality that it seems churlish to single anyone out but Beattie’s strength and authority shines through in her highly convincing portrayal of Isobel. Ron Donachie, as ever, brings a gravelly gravitas to the role of retired Inspector McLintock and Philip Whitchurch, is in turn chilling and convincingly innocent as Chalmers. The set design by Francis O’Connor, is a marvel, rotating and transforming, twisting and turning to reflect the plot and coupled with an almost subliminal sound design by composer Philip Pinsky is significant in helping establish the unsettling atmosphere that pervades throughout. To say that Ian Rankin’s debut play has been much anticipated is an understatement and there is no doubt that this is an audience pleaser. Utterly gripping, gritty and great entertainment, this is a welcome and long overdue addition to the theatrical thriller genre.